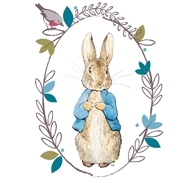 Brighten up your children's meal times with this adorable Peter Rabbit serving tray. Made from durable melamine and decorated with the classic characters of Beatrix Potter's fun tales of Peter Rabbit and friends. This serving tray features 4 separate compartments for your little one's food and snacks. BPA Free and dishwasher safe, this is the perfect addition to your children's meal times.